Online training - On your time & at your pace! iCPM Version 2.01 User Guide - NEW! Seller Order Manager User Guide - NEW! Training documents and online video training modules are free for Car-Part customers - please call 859-344-1925 or contact your sales rep directly for login information! 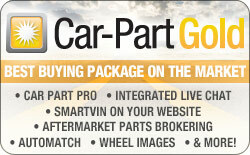 Password-protected content is available only to Car-Part customers. If you experience difficulty viewing PDF files, download Adobe Reader here.